As you may be aware the General Data Protection Regulation (GDPR) comes into effect on May 25th 2018. The regulation applies to you if you have customers based in the European Union economic area when it comes to collecting, controlling and processing the data for these customers. Here at Gather, we share the same objectives behind GDPR. We value customer's rights for data protection and privacy, and we think this would yield to better results for your business as well. Our team have been working hard on implementing measures for complying with GDPR and for helping you comply with GDPR too. We at Gather are considered as processors of your customer's personal data. This is where you, as a Gather app user, are considered as a controller. The nature of processor-controller relationship is now documented in our terms and conditions. You can access and read them here. As with all Apps, the use of the service means that you accept those terms and conditions. To reiterate, we are committed to helping you make the required changes for GDPR. Compliance with GDPR is an ongoing process that requires continual improvements from now and beyond the date the regulation takes effect. We have listing the things we are working on now, and will continually update this article to give you the heads up on new features we are working on to help you comply. Email optin popups, by nature explicitly ask for your customers' optin to your marketing material. This is unlike website registration forms that have checked boxes for marketing subscriptions or the ones which confusingly ask you to check the boxes for opting out instead of opting in. Such forms aren't compliant with GDPR. 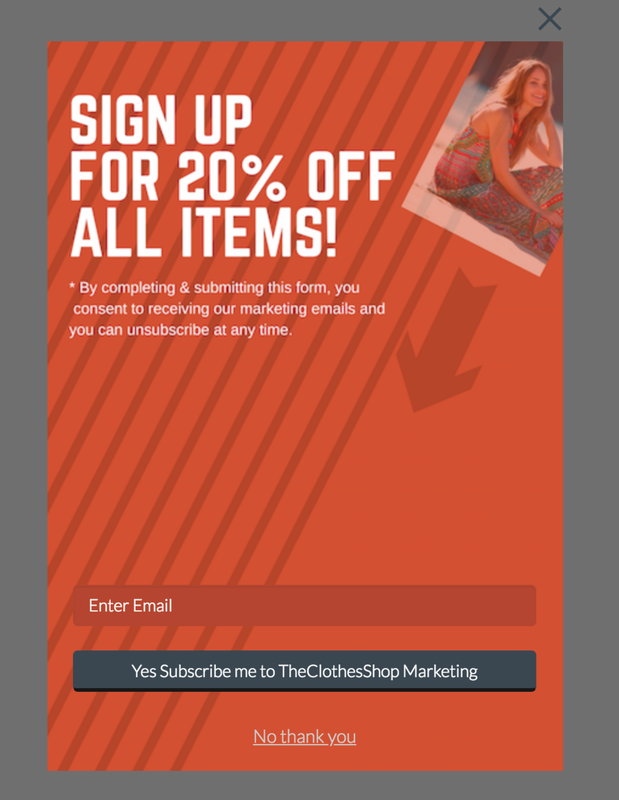 Gather's email opt-in popup forms already give you a time stamp for your customer's opt in. Gather's popups record the page on which a subscriber opted in, so you know where they opted in. If you have customers in the EU, we recommend you ask explicitly for consent in the popup copy. To give you freedom in positioning your consent statement, we recommend that you use the "Your Banner" theme and design a banner image in a design app like Canva or your preferred image editing software. In addition to that, we will be working on adding things like checkboxes to give you extra record of consent, as well as bigger popups that allow for more space in which to ask for consent. You can request from us to delete any personal data at any time. To make it easier for you to do so, we'll be working on giving you the ability to remove personal data from the Lead list in Gather with a simple click. If you are using Gather for lead referrals, we recommend that you do not enable the refer by email option if any of your customers, or their prospective friends may reside in the EU. This is because invitations are sent 'cold' to your customer's friends. We are working on making it possible for you to enable your customers to send invitation from their own email accounts, instead of using Gather's email system. Until that happens, we recommend that use the Facebook referral as well as the link they share with their friends. We will also be adding extra copy to the referral screens that both your customers and their friends see, to make them more GDPR friendly. Please keep referring back to this page as we continue to improve Gather helping you make the changes required for GDPR with ease. This article is for information purposes only, and only reflects the views of its editors and authors, and should not be construed as legal advice. We suggest that you seek legal advice about your obligations under GDPR.